In building upon Crowdstrike’s analysis, ThreatConnect researched and shared 20160614A: Russia-based groups compromise Democratic National Committee within the ThreatConnect Common Community. This incident includes the IP address [45.32.129[.]185->https://app.threatconnect.com/auth/...] which Crowdstrike lists as a FANCY BEAR X-Tunnel implant Command and Control (C2) node. 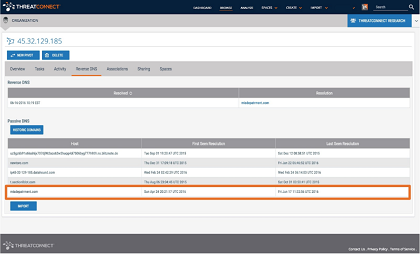 Using ThreatConnect’s Farsight passive DNS integration to review the resolution history for [45.32.129[.]185->https://www.virustotal.com/en/ip-ad...] we uncovered some additional domain resolutions. One of these domain resolutions is the suspicious [domain misdepatrment[.]com->https://www.virustotal.com/en/domai...] (note the transposition of the “t” and the “r” in department). In reviewing the Domain Whois information, our DomainTools integration reveals that the domain was registered on March 21, 2016 by frank_merdeux@europe[.]com. The domain misdepatrment[. ]com was registered on March 21, 2016. Farsight lists the earliest domain resolution as March 24, 2016. On April 24th, 2016 the domain misdepatrment[. ]com moved from the parking IP Address 5.135.183[. ]154 to the FANCY BEAR Command and Control IP Address 45.32.129[. ]185 where it remains resolved at of the time of this writing. At DNC, COZY BEAR intrusion has been identified going back to summer of 2015, while FANCY BEAR separately breached the network in April 2016. The domain misdepatrment[. ]com was registered on March 21, 2016. Farsight lists the earliest domain resolution as March 24, 2016. On April 24th, 2016 the domain misdepatrment[. ]com moved from the parking IP Address 5.135.183[. ]154 to the FANCY BEAR Command and Control IP Address 45.32.129[. ]185 where it remains resolved at of the time of this writing. On June 16, 2016 Secureworks reported that a Russia-based group, operating on behalf of the Russian government, used a combination of bit.ly short links and a fake Google login page to target the Clinton Campaign between mid-March and mid-May 2016. The group, dubbed TG-4127 (aka APT28, Sofacy, Sednit, and Pawn Storm), also targeted DNC staff between mid-March and mid-April 2016. This timeline is consistent with the misdepatrment[. ]com registration and resolution changes as well as CrowdStrike’s assessment of FANCY BEAR tactics, techniques, and procedures (TTP). Upon identifying this additional infrastructure, ThreatConnect notified CrowdStrike and MIS Department Inc. of the findings. 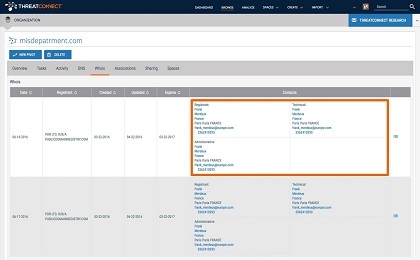 Additionally, it is important to note, ThreatConnect does not have specific evidence that indicates MIS Department Inc. was targeted or breached. However, the registration of a faux domain is consistent with the TTP’s in which FANCY BEAR is known to conduct their operations, and at a minimum demonstrates operational intent. Given that the suspicious domain came into existence and transitioned into an operational state on dates which align with the CrowdStrike timeline, as well as the notable clientele of MIS Department Inc., we estimate that FANCY BEAR likely created and staged the misdepatrment[. ]com as a means of indirectly gaining or maintaining access into DNC networks. This example highlights how an organization might capture new details and add to existing content associated with a given threat actor. 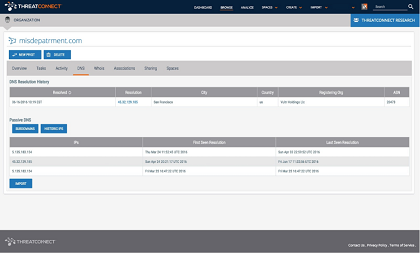 ThreatConnect consolidates publicly available intelligence with commercial sources from premier cyber security firms, such as CrowdStrike, who monitor threat groups such as FANCY BEAR. Organizations can leverage integrations with data service providers such as Farsight and DomainTools to add additional insights and uncover related elements of interest. This aggregation enriches an organization’s intelligence behind the scenes and makes the whole of these security investments greater than the sum of the individual parts. 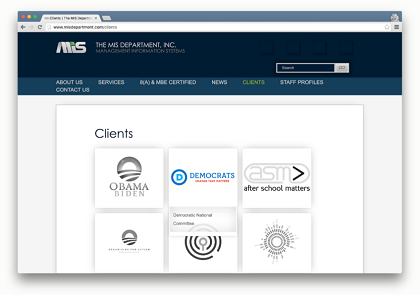 There is a wealth of publicly available information on both the Democratic and Republican National Committees. This material identifies individuals that play a part in the committee, their backgrounds, and their roles (ie. Information Technology, Finance, Communication, etc.). When possible, it is best practice to safeguard specific information regarding organization employees and affiliates as such information could be leveraged by APTs in social engineering campaigns.